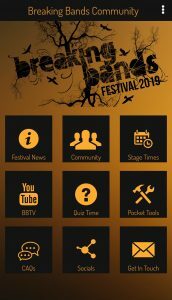 With the 5th Anniversary of Breaking Bands Festival getting ever closer, it is finally time to officially unveil the brand new Breaking Bands Community app. The organisers have been working on this for quite a while and although it has been live on some platforms for a while, the green light was finally given today from Apple and now it is official! FESTIVAL NEWS: Exactly what it says. All the news announced via the website can be read in the app. COMMUNITY: This is like a stripped down social media site just for app users. No adverts, no annoying spam posts and no ego drama! Just a social media wall to chat to others, friend request each other, app photos and videos. Nothing else. No groups, no pages, just a community. STAGE TIMES: We have actually put the stage times live right in the app. The times will be up on the website soon but we wanted to get them into the app in time for launch. BBTV (BREAKING BANDS TV): Our very own Youtube channel dedicated to the bands playing the festival so you can check them all out from the app. QUIZ TIME: We’ll be launching this officially on the 1st of each month with a new multiple choice quiz mainly based around the festival and the bands playing or those who have played. Its all a bit of fun and updates every month. POCKET TOOLS: Here you can find short cuts to your phone torch, a weather guide, a step-o-meter, directions map, countdown to the festival and…. a colouring book!!! CAQ’s (like FAQ’s but community asked questions): So basically if anyone has any questions about the festival, especially those coming for the first time, they can ask questions here and the community can answer them. SOCIALS: These are links to our social media pages. GET IN TOUCH: Well, that one is obvious! 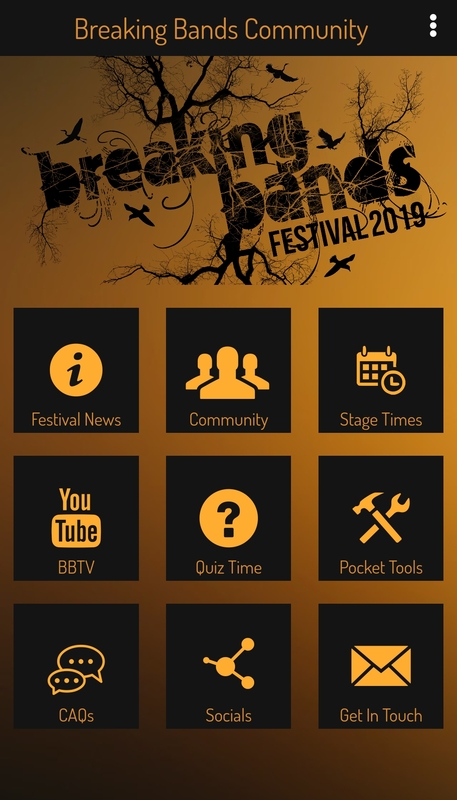 So there we have it, a fully interactive festival app built for the Breaking Bands Community and one that we can be proud of. Search in Google Play, Apple, Amazon and Windows for BREAKING BANDS COMMUNITY and get it downloaded today!